This post will probably make little sense if you haven’t seen last year’s film Whiplash, and, on top of that, contains spoilers. Proceed accordingly. 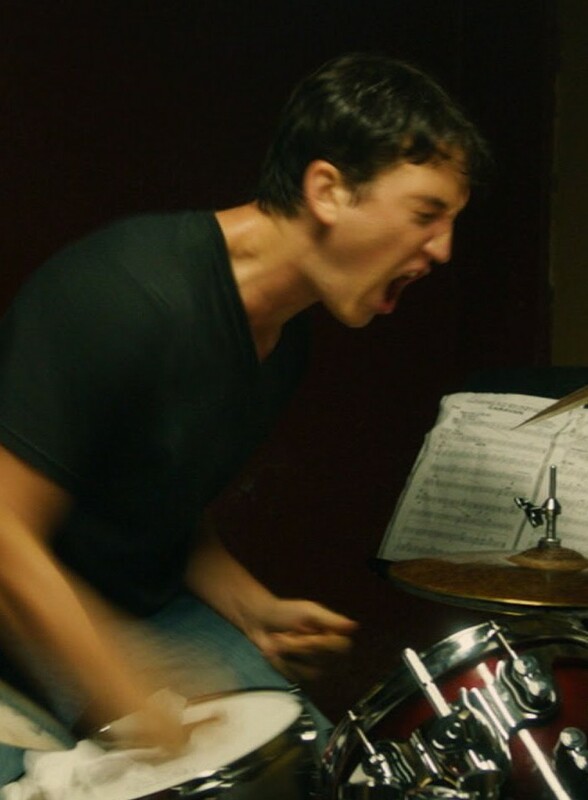 The film Whiplash is about a student jazz drummer pushed by an abusive teacher. Being a recent student of swing drumming, I was interested to see it, especially since the last film to focus on a jazz drummer was probably The Gene Krupa Story in 1959. However, being passionate about pedagogy, swing/jazz, fiction writing, and also being a swing dancer who has worked very hard to get to where I have gotten, the film left me with a lot of thoughts. Here are most of them. (1) It is a well-told — and deceptively complex — story. Completely from a dramatic point of view, this story, with its single, simple plotline, is very well-told. The writing is powerfully minimalistic, the acting is powerfully emotional, and the camerawork is powerfully bold. I can close my eyes and still hear the tone of voice of the teacher Fletcher, can see nothing but his eyes and the skin wrinkle around them, can still see the cymbal fall during the solo. Furthermore, if you’re not thinking too much into it, the film’s finale is the kind that pulls you out of your seat and demands you tackle your worst demons. Or, at the very least, bang on something. Fascinatingly, the very barrage of drums and cymbals that create this sensation also cover-up the more quiet implications and mysteries of the ending. For instance, in his final defiant solo, the character proved he could play drums incredibly well. But what else it proved is ambiguous. Did he prove the teacher had no control over him, or, by winning the teacher’s approval, could the teacher now be more in control of him than ever? Did he prove he had what it took all along, or did he prove the abusive teaching methods worked? (2) The film gives a subtle shout-out to temperamental drummers. (3) The teacher has a flawed understanding of good teaching. I put “debate” in quotes because I think it’s fundamentally flawed to try to categorize the teacher as either “good” or “bad.” Some of his methods are good, some of them are bad. The fact that they are tied together is what makes him compelling/horrific to watch, but also sadly what makes some viewers think he is somehow justified in the way he acts. To those who don’t understand effective teaching, his methods can give a mistaken impression of what it takes to be an effective teacher with very high standards. When he says “You are not keeping my tempo.” “Were you rushing or dragging?” “You have to earn the part,” he is being a good teacher. He is stating facts (and thus keeping critiques as realistic observation rather than charged with negative emotions), asking students about their awareness of their craft, and challenging students that it will take a great deal of work and attention to get the best part. When Fletcher insults the student, threatens him, physically abuses him, and throws furniture at him, he is being a bad teacher. It causes crippling anxiety, self-destructive behavior, and ultimately the understandable desire in students to attack their teacher. The tricky part is that even when Fletcher is being tough, it is showing both the good and the bad teaching aspects of being tough: dropping students from their first chair position the moment someone else plays better than them is a common practice in conservatories, and is about simple, unemotional assessment of skill. Person A is better than person B at this part. Therefore person A gets to play the part. But abusing them verbally while doing so is not. Top conservatory professors, annoyed that people will be turned away from jazz programs by this film, have gone on record to say a man like Fletcher would be thrown out of their schools quickly no matter how great he was. When it comes down to it, the teacher/student relationship in the film is really the same as an abusive romantic relationship — just as abusive spouses often justify their actions by saying they strike their spouses in order to teach them and keep order in the house, the teacher Fletcher justifies his actions by saying his abuse was the only way to get the best out of his students. Some people have asked, would the student have been as good a drummer by the end if it weren’t for Fletcher’s methods? I would like to save this answer until later, after we discuss a few other responses to the film. (4) The teacher has a flawed understanding of jazz history. The teacher Fletcher aspires to help one of his students become the next “Charlie Parker,” specifically,his Charlie Parker. He feels it’s his style of teaching that will make one of them that Charlie Parker. But Charlie Parker was a jazz lover without a single teacher, let alone an abusive one. Jo Jones throwing the cymbal at Charlie Parker’s feet (which is the way, if it happened, it has always been reported as happening) was not the same as Jo Jones following Charlie Parker around and insulting him and humiliating him to greatness. 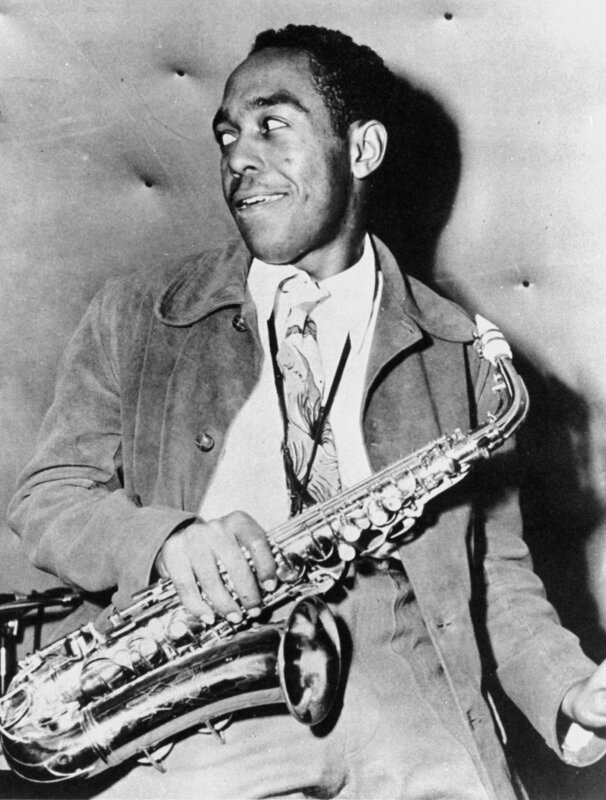 Charlie Parker went away for awhile, and on his own came back as the brilliant saxophonist he was. All great original jazz musicians I ever heard of were, ultimately, their own invention. They may have often worked under mentors, but their greatness was their own hard work and commitment. Louis Armstrong, Lester Young, Billie Holiday, Dizzy Gillespie, Miles Davis, Artie Shaw, and even the Whiplash student’s idol, Buddy Rich. They were able to keep the highest standards, despise mediocrity, and practice till they got it right without someone else’s abuse to make them shake while they tried to do it. “Papa” Jo Jones, drummer for the Count Basie All-American Rhythm Section. Let’s focus specifically on the Count Basie band’s Jo Jones — my greatest swing drummer influence, and the man who threw the cymbal at Charlie Parker’s feet. Jo Jones learned drumming by sitting at the feet of other great drummers of his time, and then by trying to play and keep up in jams, cutting contests, and bands. He could imitate many of the greatest drummers of his youth because he spent so much time trying to play like them. 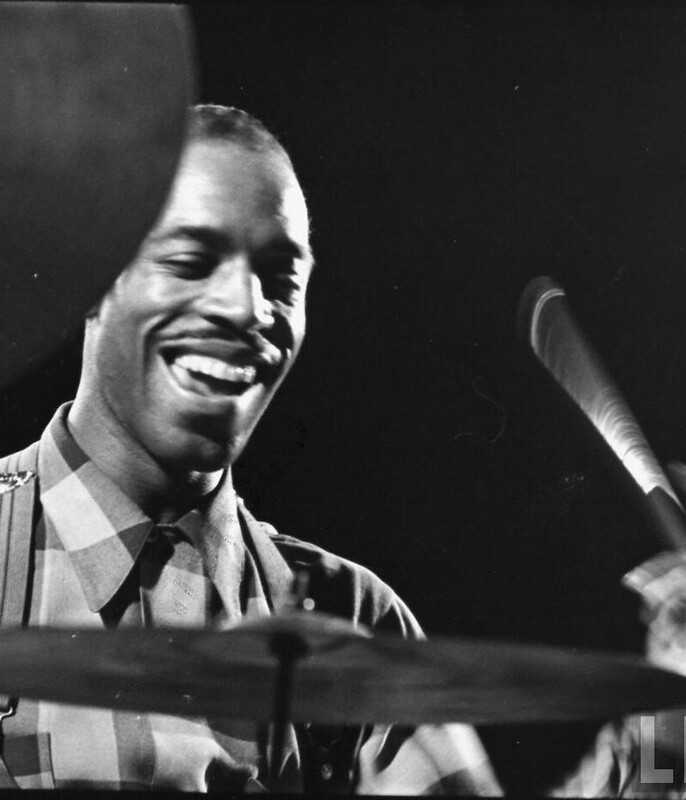 But he also had developed a hugely influential and playful voice of his own, pioneering a good deal of the way we hear swing drumming today, and had such high mastery of his craft that he is widely regarded as one of the greatest jazz drummers to ever live. 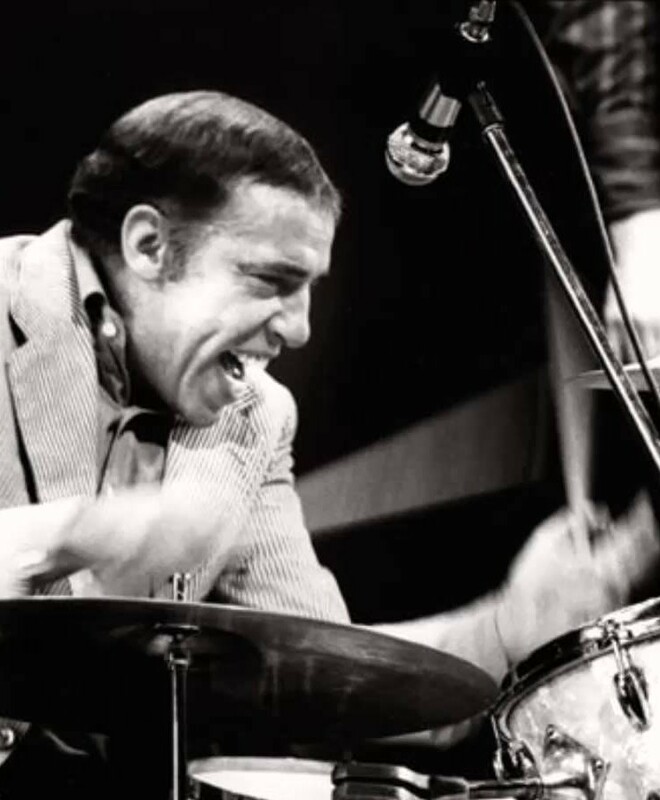 Like fellow great jazz drummer Buddy Rich, he was ornery, a perfectionist, and open with his opinions. But all of that was his own doing. From a storytelling point of view, I personally would be much more interested in Jo’s story of becoming a great jazz drummer than the young Whiplash conservatory student. I think it would say a lot more realistically about greatness in general, as well. (5) The characters have a flawed understanding of the cost of greatness. Fletcher and the student are two people under the delusion that greatness has to cost you great sacrifices not just in time, but in physical health, mental health, and happiness. Thus, the film makes the choice to concentrate on Charlie Parker’s end — dead in his 30s from years of drug abuse (this is also the way the writer/director of the film saw the student’s life ending, as stated in an interview). And both the student and the teacher display the greatest reverence for Parker and, eerily, the desire for the student to have the same path in life even at the same costs. But both of them, and the film, completely ignore the fact that among all the great jazz musicians, Charlie Parker’s tragically young death was by no means the rule. Louis Armstrong, Artie Shaw, Count Basie, as well as the great swing drummers Buddy Rich (the student’s idol) and Jo Jones, all had long and prolific careers. I’d like to compare, not all in jest, the student’s desire to cut off a social life in order to practice more with Lester Young’s desire to quit drums and take up saxophone so that he could put his instrument away quicker and meet women. There’s also the interesting point that trying to get “the next Charlie Parker” out of a drummer is in itself kind of a a flawed concept. From my understanding, what made Parker great was how he almost single-handedly created an entirely new way of understanding jazz and jazz soloing based on the notes of the melody, and thus played a huge role in evolving jazz to its next iteration. As good a jazz drummer as the student could be, he probably would not be able to do something comparable to that. Finally, I understand I’m talking only about swing musicians here, the ones I know; I’m very not up to date on post-50s jazz musicians. But, luckily for me, the teacher and student in the film’s conservatory (unrealistically) only mention pre-1950s jazz musicians, so I think I’m allowed. (6) The film/student has terrible practicing habits. The film creates a dramatic spectacle: the student playing drums so hard and forcefully that his hands bleed. By storytelling standards, its a simple and powerful way to show you how hard this student is working towards his goal, and at what cost. But before you learn your practice habits from Hollywood, it’s important to understand the reality. Just one example: conservatory musicians practice being as relaxed as possible to achieve their goals. If a drummer simply practices by gripping a stick harder and harder (like the student in the film), then the sound is more and more “stiff.” Powerful drum sounds are from the sticks bouncing off of the head or cymbal, not being driven into it with an iron grip. Yes, playing faster requires more precise use of greater tension, but it should not require bulging tension throughout the arms and body, tight grimmaces, and blood spattering onto the drums. Granted, the practicing scenes would not be as dramatic if the student were constantly stopping and making sure he relaxed before playing again. (7) This film is kinda bad for jazz. There is nothing out of the ordinary about this. Most genre stories are actually about much more broad human experiences. From a film that actually was about the spirit of jazz. 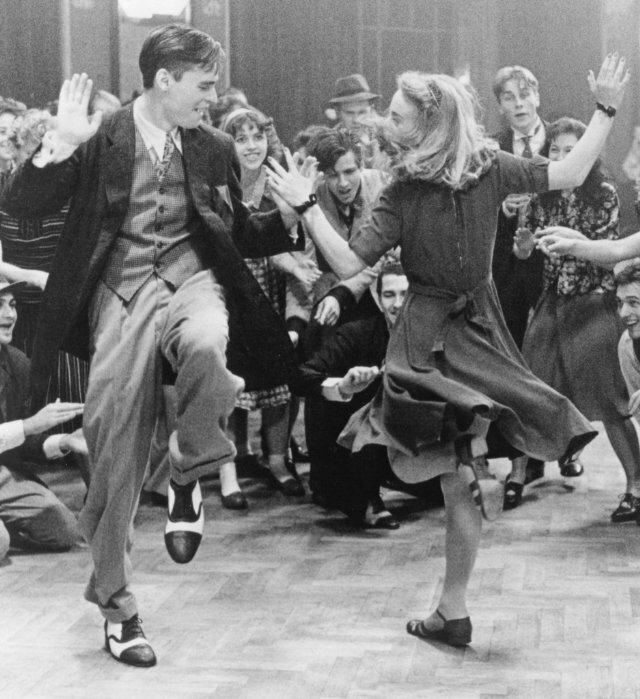 Swing Kids, for instance, is not about swing dance — it’s about a youth raised in a fascist state learning to stand up against fascism. However, I’d argue that the film wouldn’t work near as well if you took out the swing music and dancing and instead used youth boxing or Polka (Polka Kids). That’s because the spirit of swing is joyful, cross-cultural, cross-class, democratic — all things that are the contrast to fascism. And it’s exactly the kind of activity that would make a young, sensitive German youth rethink the racist dogma he was expected to believe. Sure, it didn’t get any Oscar nods or win any awards. But at least swing music was actually important to Swing Kids. In turn, the film was great for classic swing; it reminded the world that “Sing, Sing, Sing” existed and was a pretty fantastic song, and seeing how the characters in the film loved the music and dance so much got people like me really excited about joining in their experience. After all, the world of swing is portrayed as music so good and so right you’d risk getting arrested just to experience it. In Whiplash, however, the world of jazz is portrayed as abusive conservatory masters, people practicing joylessly and anxiously cutting out all their social life, the idea that you have to be bullied into greatness. Jazz gets a bad name in this film. And, if it had to be jazz musicians the film was about — one who listens to Buddy Rich solos over and over, and who appreciates Charlie Parker as an idol — I don’t like it that the director/writer made only a tiny bit of effort to show the positive spirit of jazz, and why jazz is worth all the hard work these two people are putting into it. It wouldn’t have taken a lot. Maybe, while on his way to practice until he punches through another drum head, the student walks by a group of street jazz musicians tearing it up and actually having fun while they played. Maybe at some point he watches something other than just Buddy Rich YouTube solos, and we the audience join him in awe as he watches the quieter wryness of the Count Basie rhythm section, or the anxious dreaminess of “Blues in Green” by Miles Davis. The kind of jazz where the silence of the drummers is just as important as the noise. Maybe he tries his hand at an actual jam session and actually trades 4s or 8s with a great musician, so the film can acknowledge that the spirit of jazz is just as much a conversation as it is a solo. (8) So, would the student have been as good a drummer by the end if it weren’t for Fletcher’s methods? And that’s where I think the responsibility belongs, as it has with all the other jazz greats. Had Fletcher kept to only the “good” teaching traits mentioned, he would have been a fantastic resource for the student to use to achieve greatness on his own — as a teacher, Fletcher is clearly passionate about the music, knows his stuff, and knows how to challenge his students. Sure, there might have not been the abuse to push the student to work at his drumming at the expense of his health and happiness so that he could be amazing at that very moment. But surely if the student is meant to be a great drummer, it should be his own responsibility and choice to push himself to that greatness. Not have to be forced or manipulated into it by a bully. Also, without an overbearing teacher, the student might be able to actually learn how to interact with other musicians. Then he could play jazz with them, rather than only alongside them. Interesting analysis. Haven’t seen, just the previews. A couple of thoughts. You make an interesting point in discussing Jazz in particular, as opposed to Ballet or boxing. Until the 60s I think, Jazz was strictly from the music halls and marching bands and dance halls. Musicians learned from other musicians, and there was a kind of aprenticeship as well aas going out and hearing. It was only fairly recently that it entered the conservatory, long after the genre was already set. Especially being high on improvisation, the conservatory system may not be best suited to teach jazz. The methods of the teacher, while hollywood idea of teaching may or may not reflect real conservatory teaching, but they absoultey do not reflect how any of the greats of then or probably now learned. Not jazz greats anyway. While jazz requires precision and discipline, it probably differs from classical music and maybe the teachign methods are likely to differ too. Secondly, this is not new, it is an old trope, the ballet teacher, the drill instructor who is hard on the recruit, etc so that the recruit finds it in themselves. The idea is to teach self discipline by creating consequences. the di that abuses his troops because he cares about them is probably the closest to this movie. But that is war and it is about saving lives and also creating a cohesive unit where no man thinks of himslelf first. It is not about achieving the strictyly highest performance from a soldier. I stumbled upon this about 18 months too late but never mind :D…Great critique, closer to what I thought after watching the movie than most comments I’ve read. 1) Jazz is all about interactions between musicians. The movie doesn’t show any, except competition, derision and anger. He never talks with anyone in the band – scary. 2)The kid is in a top music school, where are his OTHER teachers? Never in my experience a student in music has only interacted with the band director (except in small schools where there is only one teacher, of course). He should have at least a drumming teacher (who could tell him to relax, indeed) and a music theory teacher. Un saludo lidy hopero desde granada españa.